A man suing Sussex Police after he was Tasered has told a court the incident left him anxious and suicidal. A Taser was used on Paul McClelland in July 2013 in a car park in Brighton as he was being arrested for shoplifting. A video of the arrest was passed to The Argus newspaper at the time. In a civil case against the chief constable of Sussex, Mr McClelland is claiming the police used excessive force in carrying out the arrest. Sussex Police has rejected the claim. Sophie Khan, Mr McClelland's solicitor advocate, said he was bringing the case against Chief Constable Giles York because he believed he was Tasered unreasonably when he was surrendering and moving backwards to be handcuffed. He was arrested in Western Road, Brighton. An internal police investigation found the force had done everything correctly and there was no evidence of misconduct. Mr McClelland, 42, pleaded guilty to obstructing a police officer, common assault and theft at Brighton Magistrates' Court two months later, and was given a community service order. On Monday, His Honour Judge Simpkiss, sitting at the County Court at Brighton, was shown the video of what happened. The court was shown the situation from three different angles, as recorded by council CCTV, a body-worn police camera, and a video filmed by a passer-by. Mr McLelland admitted he had been sitting on the beach drinking strong lager before the incident. 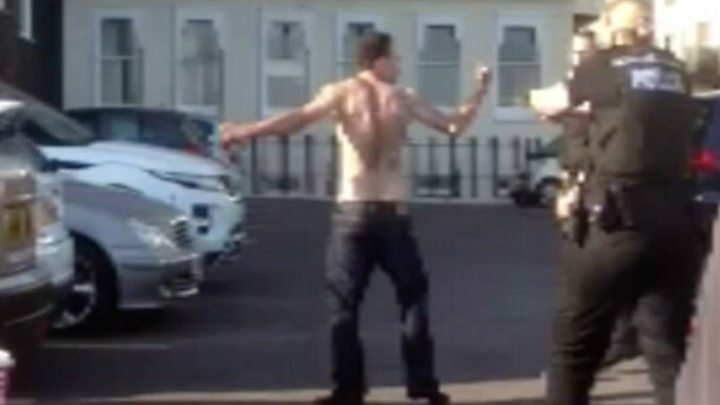 Before he was Tasered he removed his shirt and adopted a boxing stance, shouting to police: "Come on." He agreed that he would not have behaved that way had he been sober, the court heard. He said the pain of the electric shock was like "death". "You can't breathe, it takes your breath away," he told the court.